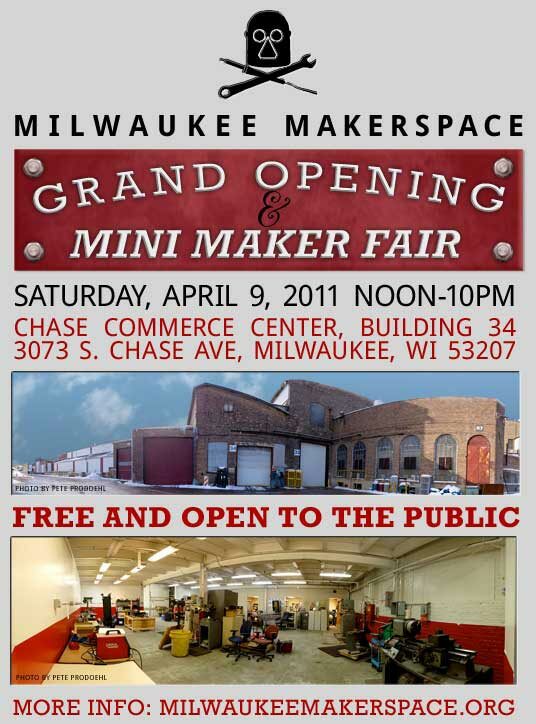 Join us Saturday, April 9th, 2011 at the Milwaukee Makerspace for the Grand Opening & Mini Maker Fair! I’ll be there showing off some of my recent projects for the Mini Maker Fair, so if you’ve ever wanted some hands-on with the stuff you’ve seen on my blog, well, this is your chance. You can visit milwaukeemakerspace.org for more info (and I hear they are close to launching a redesign) or you can follow them on the Twitters at @mkemakerspace. You can RSVP on Facebook (and see who else is going) or just show up… I hope to see you there! Posted on Monday, March 28th, 2011 at 11:30 am. Subscribe to the comments feed. Both comments and pings are currently closed. Post on your own blog.